Here we have the most addictive snack known to mankind! Seriously once you start eating the Caramel Corn Snack Mix you won’t know when to stop! In other words don’t say I didn’t warn you. This is probably my favorite caramel popcorn recipe to date and I’ve made my fair share of caramel popcorn. What makes this one so special? 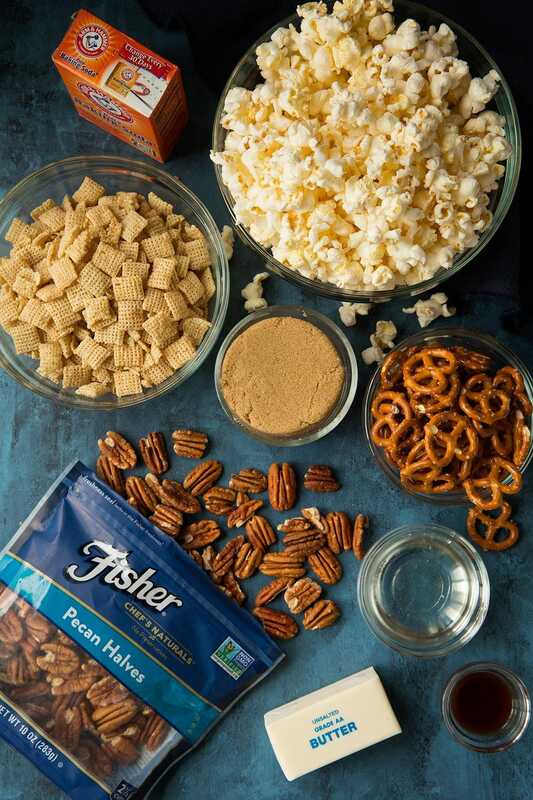 It’s not just caramel popcorn, it’s caramel – popcorn, crisp rice cereal, salty pretzels and crunchy pecans. 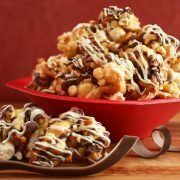 It’s caramel popcorn with the works and your going to love it! If your family are basketball fans then this is most definitely the perfect treat to make to munch on during the game, no other snacks will matter. And for me I’m already planning on making it again for an upcoming road trip. Everyone of us absolutely loved this caramel popcorn! And I loved how easy it was to make. 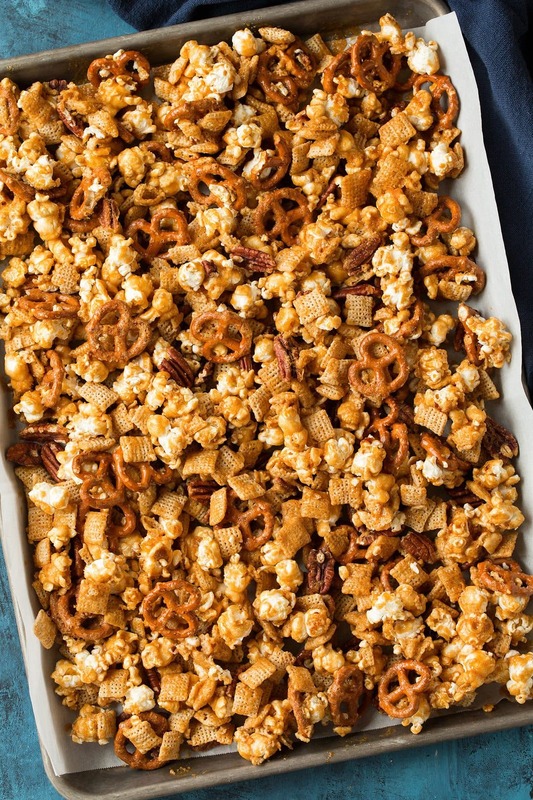 You just boil together a few ingredients then toss it over the mix of popcorn, cereal, pretzels and pecans and bake it in the oven for 30 minutes. It’s probably a bad thing it’s so easy to make because it’s just so dangerously good! For this recipe I used pecans. They’re a healthy snack or a great addition to your favorite baking and dinner recipes. They are even delicious in chicken salad too. Now what are you waiting for?? Head to the store if you don’t already have the ingredients for this recipe and get cookin! 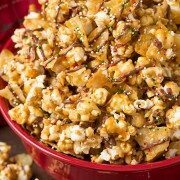 This addictive snack is perfect for parties or gifting! It's easy to make and always a crowd favorite! 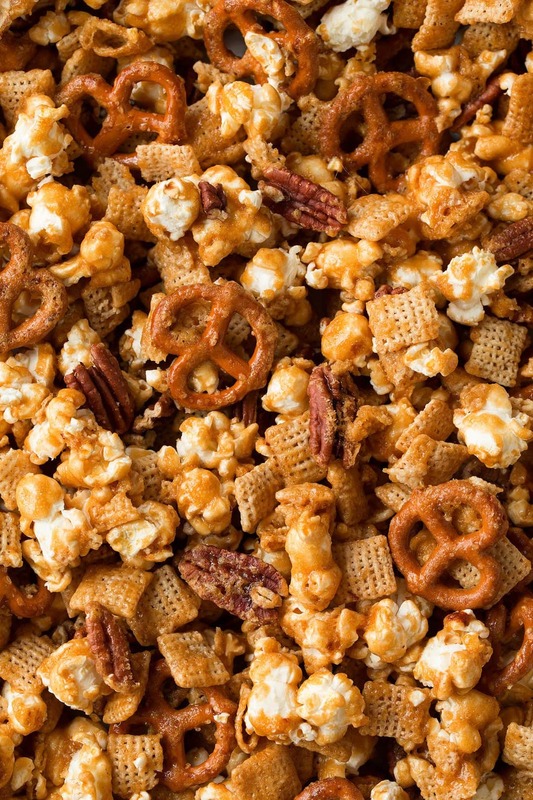 No one can resist this sweet and salty, crunchy, caramel snack blend. Preheat oven to 350 degrees. Line a rimmed 18 by 13-inch baking sheet with parchment paper or a silicone baking mat, set aside. 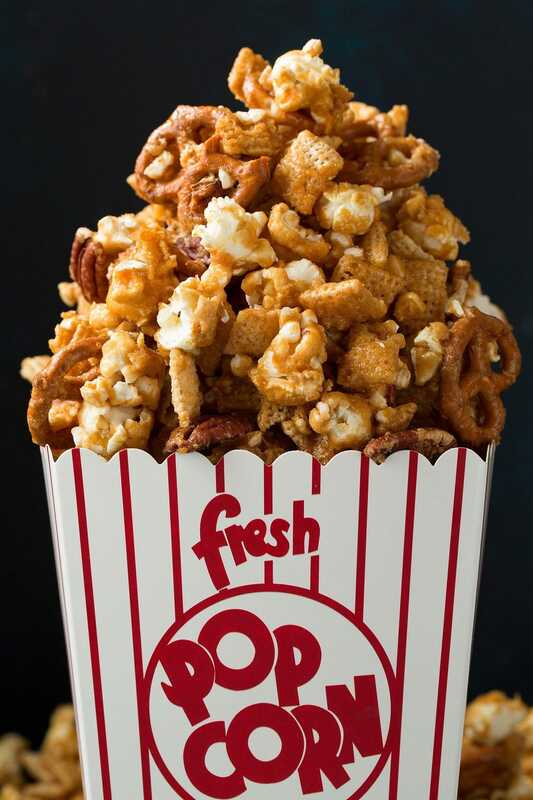 Add popped popcorn, rice cereal, pretzels and pecans to an extra large mixing bowl, set aside. Melt butter in a medium saucepan over medium heat. Add in brown sugar and corn syrup and bring mixture to a boil stirring constantly. Once it reaches a boil, reduce heat to medium-low and allow to boil, without stirring, for 4 - 5 minutes. Remove from heat, whisk in vanilla and baking soda (mixture will bubble up and foam). Immediately pour mixture over popcorn and quickly but gently toss to evenly coat. Spread mixture evenly into prepared baking sheet. Bake in preheated oven 15 minutes then remove from oven and toss mixture then spread into an even layer. Return to oven and bake 15 minutes longer. Remove from oven and let cool then break into bite size pieces. *Don't use flavored, buttered or salted popcorn. 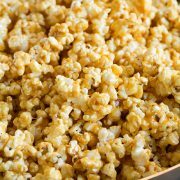 Remove any un-popped kernels after popping. Paige: This looks incredible! I need this in my life.